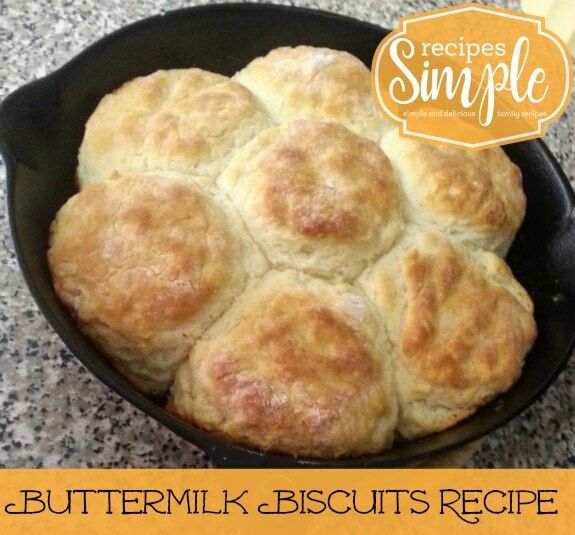 My mom used this Buttermilk Biscuits recipe that she found in a Southern Living magazine many years ago. 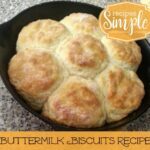 It makes the best Buttermilk Biscuits and it’s now become the only recipe our whole family uses! Grate frozen butter using large holes of a box grater. Toss together grated butter and flour in a medium bowl. Chill 10 minutes. Make a well in center of mixture. Add buttermilk, and stir 15 times. Dough will be sticky. Turn dough out onto a lightly floured surface. Lightly sprinkle flour over top of dough. Using a lightly floured rolling pin, roll dough into a 3/4-inch-thick rectangle (about 9 x 5 inches). Fold dough in half so short ends meet. Repeat rolling and folding process 4 more times. Roll dough to 1/2-inch thickness. Cut with a 2 1/2-inch floured round cutter, reshaping scraps and flouring as needed. Place dough rounds on a parchment paper-lined jelly-roll pan. Bake at 475° for 15 minutes or until lightly browned. Brush with melted butter. If you want Crunchy-Bottomed Biscuits warm a cast-iron skillet in the oven and spread some butter in the skillet before adding the biscuits. The bottoms will end up crunchy and golden brown. This Southern Living Buttermilk Biscuits recipe makes the best Buttermilk Biscuits and it’s now become the only recipe our whole family uses! Is it one or two cups of buttermilk? It’s listed twice. It’s one cup. Sorry about the confusion. I didn’t realize that had posted twice.